Drilling fluids play a vital role in oil and gas exploration activities. These are a mixture of water, oil, clay, and several chemicals. Drilling fluids are also known as drilling muds. Drilling fluids perform numerous functions such as cooling the drill bit and lubricate its teeth, carrying the drill cutting to the surface, and reducing drill pipe stuck problems during drilling operations. Muds help maintain hydrostatic pressure to prevent fluid formation from entering the wellbore. The year-on-year growth in drilling activities has fueled the demand for drilling fluids. Rise in the number of marine ships for several operations inside and outside a country has boosted the demand for fuel-efficient marine propulsion systems. Demand for synthetic-based muds is anticipated to increase owing to the environmental regulations imposed by governments of several countries. Synthetic-based muds were developed to reduce the environmental impact of offshore drilling operations. Synthetic-based muds contain specialty chemicals that are costlier than oil-based muds. Implementation of strict regulations around the Emission Control Areas (ECA) across the globe has increased investment in water-based muds for drilling operations. Stringent regulations pertaining to carbon emissions and oil spillage have increased investments in the development of water-based muds. Furthermore, governments of several countries are funding and supporting development and adoption of the latest technology in drilling fluids for drilling operations. Rise in investments in the exploration and production of offshore oil & gas is propelling the adoption of drilling fluids around the world. Increase in upstream activities of the oil & gas industry is expected to boost the production volume of crude oil. This, in turn, is propelling the drilling fluids market. Global price of crude oil has been increasing at a steady pace since the beginning of 2018, and offshore and onshore exploration and production activities have increased at a rapid pace. Demand for drilling fluids is anticipated to rise in areas such as North Sea in Norway and Bakken field in the U.S. According to the International Energy Agency, approximately 65,176 wells were drilled in 2017. This has increased the demand for drilling fluids. New approvals from several governments for drilling operations across the globe propel the demand for drilling fluids in onshore and offshore operations. In September 2018, Schlumberger Limited launched the CemFIT Shield mud-sealing cement system. Long horizontal wells with multistage completions face drilling fluid removal challenges due to limited centralization and casing movement that increase the risk of zonal isolation due to drilling fluid channeling. In May 2017, Halliburton launched BaraShale Lite Fluid System, a high performance water-based fluid designed to maintain full salt saturation with reduced density. It helps prevent lost circulation and minimizes waste disposal costs. This newly launched fluid help operators overcome several challenges using a proprietary additive that combines the base fluid, which consists of brine to prevent salt washout, and oil to lighten the mud weight. In February 2018, Clariant launched a line of defoamers and anti-foaming technologies which provides foam management products for both oil- and aqueous-based fluids. Drilling fluids help minimize the loss of pump capacity, improves mud pump efficiency, reduce the amount of fluid entering gas transport lines, increase separator efficiency, increase oil and gas throughput, and prevents unplanned shutdowns. Currently, North America and Asia Pacific are key regions of the drilling fluids market. The market in Europe is projected to expand at a moderate pace in the near future, as the region is highly environment-conscious. China is a major consumer of water-based muds. Numerous attractive technologically advanced drilling fluids are expected to be launched during the forecast period across the globe. Mud engineering services and technology developers are projected to engage in research activities to develop innovative drilling fluids in the next few years. The global drilling fluids is highly competitive. Leading players dominate the market. Key players operating in the drilling fluids market include Akzo Nobel N.V., Newpark Resources, Schlumberger Limited, and Halliburton. According to International Energy Agency, approximately 65,176 wells were drilled for oil & gas in 2017. This has increased the demand for drilling fluids. High oil prices and greater cost efficiency in offshore projects are driving the demand for exploration activities. This, in turn, propels the demand for drilling fluids. Drilling fluids play a crucial role in oil & gas exploration activities. It is a mixture of water, oil, clay, and several chemicals. Drilling fluids are also known as drilling muds. This fluid performs numerous functions such as cooling the drill bit and lubricating its teeth while drilling, carrying drill cuttings to the surface, and reduces drill pipe stuck problems. Drilling fluids help maintain hydrostatic pressure to prevent formation fluids from entering the wellbore. Newly developed state-of-the-art drilling fluid treatments offer superior reliability with efficient results for the energy industry. Implementation of stringent regulations to minimize harmful carbon emissions is propelling the demand for water-based muds and synthetic-based muds. Increase in offshore drilling activities has increased the consumption of drilling fluids. Therefore, governments of several countries are funding and supporting development and adoption of the latest technologies to manufacture environment friendly drilling fluids. Several companies are actively developing synthetic-based muds for the use in complex geological formation. Rise in demand for water-based muds due to its cost effectiveness is expected to drive the global drilling fluids market during the forecast period. Developed and developing countries are investing significantly in offshore drilling. Demand for drilling fluids in Asia Pacific is gaining momentum due to the rise in offshore and onshore drilling activities, especially in countries such as China, India, Thailand, and Indonesia. This report analyzes and forecasts the drilling fluids market at the global, regional, and country level. The market has been forecast based in terms of volume (thousand bbls) and revenue (US$ Mn) from 2018 to 2026, considering 2017 as the base year. The study includes drivers and restraints of the global drilling fluids market. It also encompasses the impact of these drivers and restraints on the demand for drilling fluids during the forecast period. The report also highlights opportunities in the drilling fluids market at the global and regional level. The report includes detailed value chain analysis, which provides a comprehensive view of the global drilling fluids market. Porter’s Five Forces model for the drilling fluids market has also been included to help understand the competitive landscape. The study encompasses market attractiveness analysis, wherein type, application, and region are benchmarked based on their market size, growth rate, and general attractiveness. 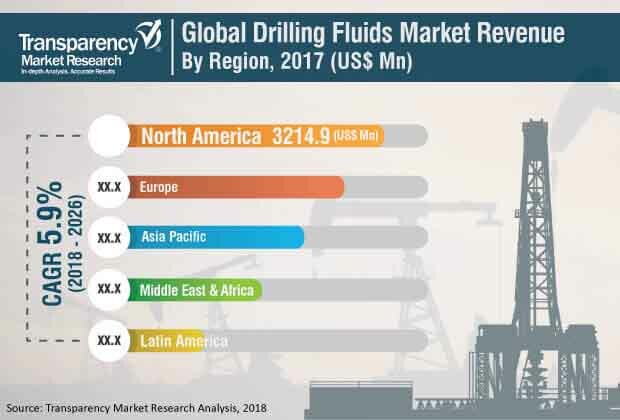 The study provides a decisive view of the global drilling fluids market by segmenting it in terms of type, application, and region. In terms of type, the drilling fluids market has been classified into water-based muds, oil-based muds, and synthetic-based muds. Based on application, the market has been bifurcated into onshore and offshore. These segments have been analyzed based on present and future trends. Regional segmentation includes current and forecast demand for drilling fluids in North America, Europe, Asia Pacific, Latin America, and Middle East & Africa. The report provides the actual size of the drilling fluids market for 2017 and an estimated size from 2018 to 2026. The global drilling fluids market has been provided in terms of volume and revenue. Market numbers have been estimated based on type and application of the drilling fluids market. Market volume and revenue have been provided in terms of global, regional, and country level markets. The report comprises profiles of major companies operating in the global drilling fluids market. Key players operating in the drilling fluids market include Schlumberger Limited, Halliburton, BASF SE, Clariant International, DowDuPont Inc., Akzo Nobel N.V., Solvay S.A., Newpark Resources, Royal Dutch Shell Plc., and Gumpro Drilling Fluids Private Limited. Market players have been profiled in terms of attributes such as company overview, financial overview, business strategies, and recent developments. Drilling fluids are used in several functions such as control of downhole formation pressure, avoidance of damage to producing formation, cooling and lubrication of the drill bit, and scavenging cuttings generated by drill bit from boreholes. Drilling fluids are essential during drilling operations. Countries in Europe, such as U.K., Norway, and Russia & CIS, have increased their expenditure on onshore and offshore drilling activities. This is propelling the augments demand for drilling fluids in the region. The consumption of drilling fluids is expected to be in demand owing to the drilling activities in the offshore areas in the North Sea, Gulf of Mexico, South China Sea, and Gulf of Oman.